J. Edgar has a novel solution for the predictable arcs and narrative doldrums of the typical biopic: make stuff up! 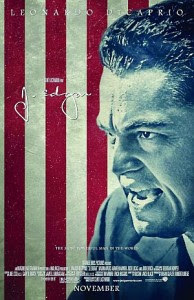 Following the life story of infamous FBI director J. Edgar Hoover (Leonardo DiCaprio) all the way into the swirling vortex of rumors about his alleged homosexuality and transvestism, the film traffics in the kind of salacious gossip that Hoover himself would've relished. And while it's not unusual for director Clint Eastwood to bludgeon audiences with his melodramatic takes on hot-button issues, his collaboration with Milk screenwriter Dustin Lance Black seems to have given him a sort of feisty vigor that extends all the way to presenting hearsay and intuition as the cold hard truth. All of this is to say that J. Edgar is at least an engrossing, sometimes surprising film, if not a particularly elegant or stylish one. Of course, J. Edgar also possesses many of the hallmarks of a staid period piece. A frame story presents DiCaprio dictating his memoirs to a rotating cast of assistants, detailing his single-minded opposition to political radicalism as a young lawyer in the Department of Justice to his forming the Bureau of Investigation (the formal predecessor to the FBI) and its agents into modern-day Knights Templar, a new breed of professional and scientific law enforcement to combat the equally new and professional breed of American criminal. All of this is juxtaposed clumsily with Hoover's attempts to consolidate his power in the COINTELPRO era of the 1960s, bugging the hotel rooms of civil rights leaders and sparring with a skeptical Robert Kennedy (Jeffrey Donovan). Toss in the aforementioned business of his personal life - mostly concerning his longtime companion and colleague Clyde Tolson (Armie Hammer, who gets saddled with terrible old man makeup that turns him into the long-lost cousin of Sloth from The Goonies) and his domineering mother (Judi Dench) - and you get a movie that frequently loses any sort of momentum in a jumble of temporal and tonal whiplash. It's hard for any film to be accused of lacking magnetism when it features a commanding DiCaprio performance, and the hot mess of a narrative allows him to draw from the same free-ranging obsessive reservoir he tapped as Howard Hughes in The Aviator. The problem is that Eastwood, while a competent filmmaker, is no Scorsese. He takes pride in J. Edgar as a broadly imagined Hollywood biopic garnished with a little gayness. It captures all of Hoover's omnipotent lifeforce but none of his subtlety; far too much of the film operates out in the open and on a singular historical level. Better is Eastwood's suggestion, presented near the end of the movie, that Hoover's own mantle of cultish patriotism and paranoia was seized by the last president he served under: Richard Nixon. Now they would have made quite the pair.